Hi Folks - One of my best friends from the 3rd grade on had just moved into a new home in October with her family only to discover she had a very fast growing breast cancer. She discovered it via self exam and it tripled in size over a couple of weeks while she was prepping for chemotherapy. To make matters worse, her husband (and his entire division) was let go from his job this week. Elisa has been a stay at home mom for her special needs children for the last several years, so the family has lost their only income source while she is very sick with chemo treatments. Losing a job unexpectedly is never easy, but losing it 2 weeks before Christmas while your wife is trying to stay alive is absolutely devastating. In addition to having cancer, Elisa has a degenerative genetic disorder (Ehlers-Danlos Syndrome) that already was causing many problems for her body. If you can give anything, please do. God bless. When we both lived in Fort Wayne, IN, we were literally inseparable. 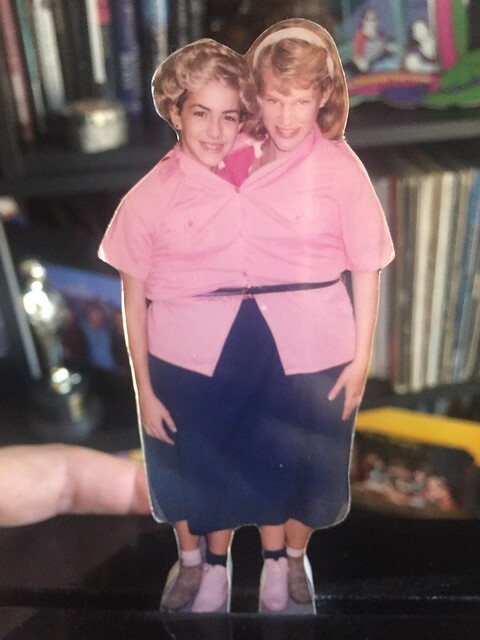 In the 6th grade we convinced our teachers that we could go to the other's classes (instead of our own) so we could wear this Halloween costume). As to why it's Defeating Voldemort? Her children decided that was the tumor's name and because they love Harry Potter, they just know he can be defeated. Her GoFundMe link can be found here. Thank you, thank you, thank you.